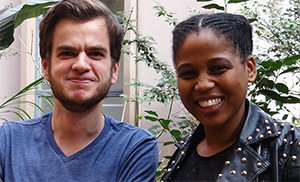 Two postgraduate students from the School of Built Environment and Development Studies (BEDS), Ms Amanda Mthembu and Mr Simon Halvey, have returned from a month-long intensive course on survey research techniques at Michigan University in the United States. Funding for their visit was arranged by Professor Dori Posel, the SARChI Chair in Economic Development. They were the only students on the course with the others being working professionals from a variety of countries. They felt the tools they had acquired would help them not only in research for their dissertations but would be useful in their future careers. They were both impressed with the range of facilities of the University, Halvey particularly by the vast football stadium which is one of the largest in the United States, and Mthembu by how safe it was to work at the 24-hour university library where it was possible to use the complimentary taxi after studying late.